Back in 2013, while working at an influencer marketing startup, my friend Daniel Hebert and I were discussing virality—that somewhat taboo, pie-in-the-sky idea of creating content that gets millions of shares and likes. It’s a marketer’s dream, but for most of us, it will never be a reality. From this bitter truth came the notion of “perceived virality”: the idea that a piece of content shared by just a few people within a highly interconnected community could create the sense of content being popular, or viral. If I see a piece of content that is interesting to me, and I have time at that moment, I may or may not read it. If I see a piece of content shared by several people I trust and recognize as thought leaders, I will take note and read it right away. If several people in my network are sharing it, it must be worth a read. As seen above, these are regular people with average reach. They know each other and have individuals within their combined audience that follow all three of them. 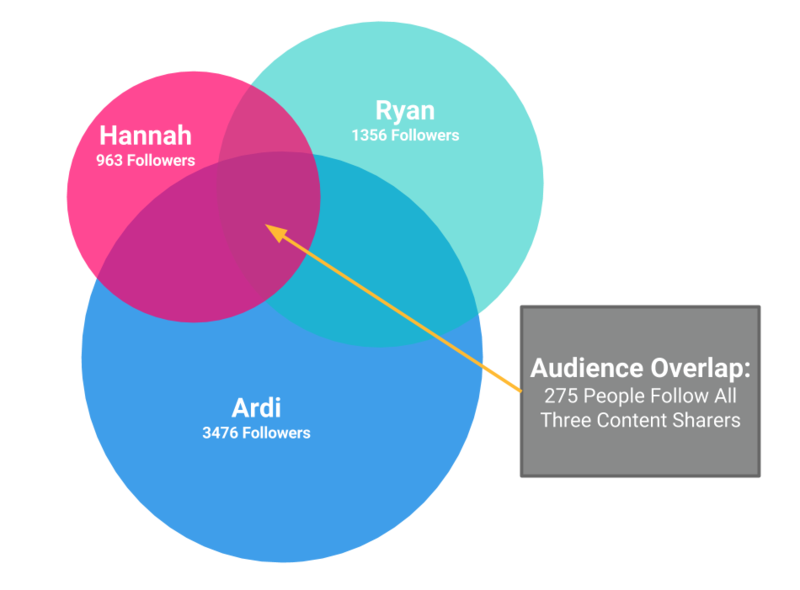 If Hannah, Ryan, and Ardi were to each share the same piece of content, it is likely that those 275 people in the overlap will see the piece of content shared by all three of them. At this point, the content is considered to be popular in this network or perceived as viral. This is a relatively easy concept to grasp. However, it gets exponentially more complicated when trying to achieve Perceived Virality at scale. 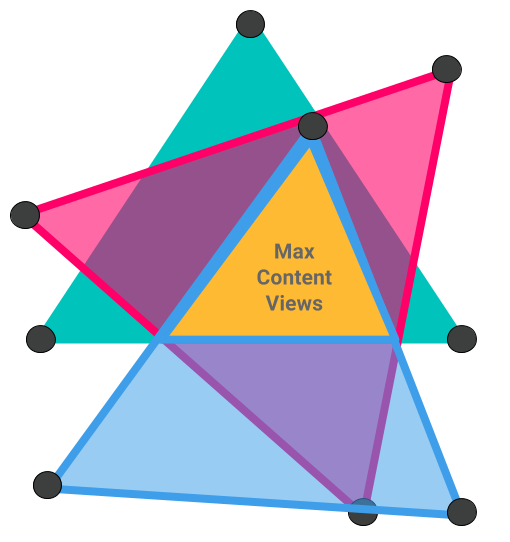 Adding just two more triangles, or six more interconnected content sharers, we see that there is the possibility of an optimal overlap in the center where followers of all nine content sharers see the shared piece of content. Picture this at an even larger scale. What if 25 content sharers have a combined audience of 60,000? It is possible that their optimal audience overlap is 5,000 or even 10,000 people depending on the density (or interconnectedness) of the community. What if 100 (or better, 1,000) interconnected individuals share the same piece of content? 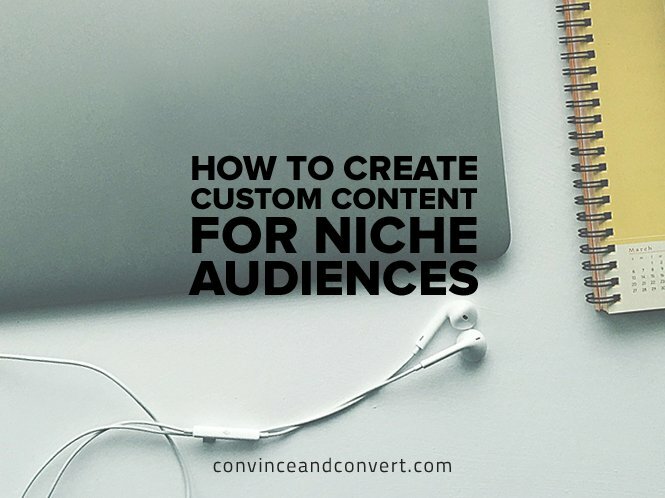 All of a sudden, there are thousands and thousands of people who are seeing this content and noting it as a “must-read.” In this attention economy, perceived virality is the ideal way to break through the noise and make a connection with your ideal audience. How Do You Achieve Perceived Virality? By analyzing the interest graph, or how people are connected to each other and to brands, publications, and celebrities, we can identify the clusters of individuals who are highly interconnected. To do this at scale, you need data science and robust algorithms. The nodes (or dots) represent the interconnectivity of the clusters (or communities). The closer the nodes, the denser the community. The lines represent shared interests within a cluster and from one cluster to another. As you can see, the Sports Business cluster is highly interconnected with a high degree of shared interests. 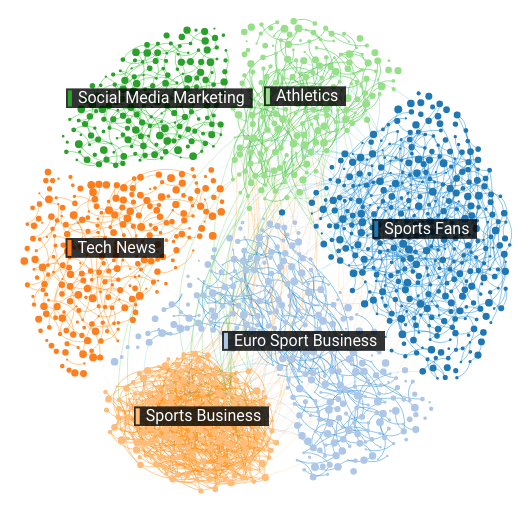 To learn more about the Sports Business cluster within the Affinio report, I looked at their top relevant accounts. These are the people, brands, publications, media, and celebrities that are most important to this cluster (click the image below to download the full list). Looking at the Twitter profiles of a few of these top accounts, I stumbled across a conversation between @SportsBizMiss and a writer who had recently published an article called “7 Sports Business Guys You Should Follow on Twitter.” Miss Dosh had politely pointed out the lack of women on the list. The conversation went back and forth with the writer owning his mistake, and Miss Dosh suggesting a few women to consider for his next list. 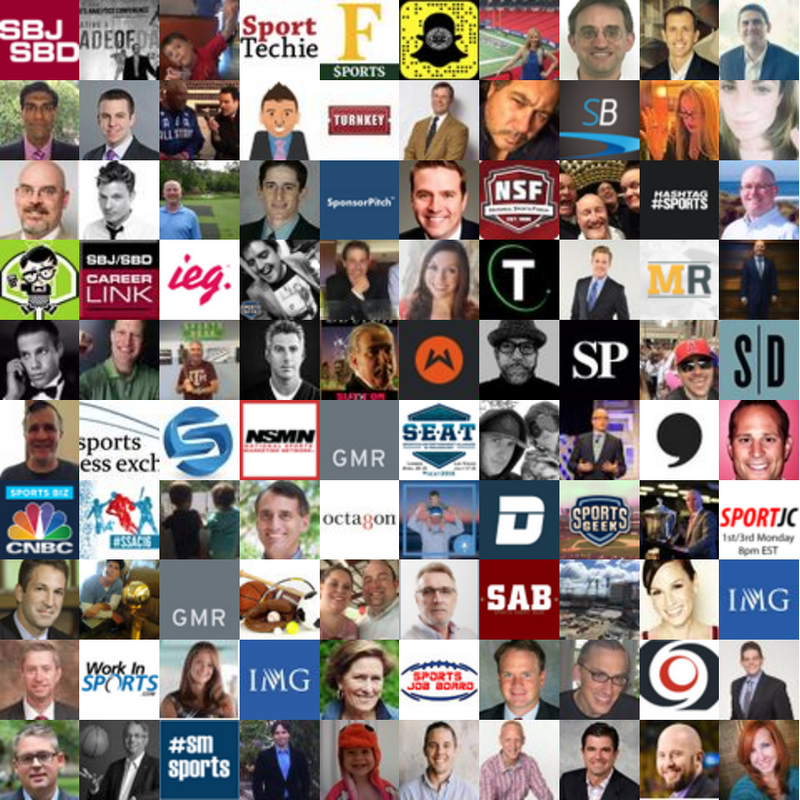 Having just run an analysis on this exact topic, I jumped in on the conversation, tweeting a screen grab of the top 100 relevant accounts in Sports Business. All of a sudden, my Twitter started blowing up with, “Thanks for including me,” and, “Congratulations, X for making the Top 100,” messages. I went to bed that night and woke up the next day with around 50 new notifications. This was thrilling for me, not only because I was getting a taste of fame, but because I had achieved perceived virality in a community I knew little to nothing about before my research. Some of the tweets I was receiving from my new found audience were looking for more information about the list and where it had originated. While the conversation was still hot, I published an article showing my methodology and offered more data on the community. I am writing this article four days after I initially engaged in the conversation. Twenty minutes ago, the seventh-ranked relevant account quote-retweeted my tweet with a “Thank You” and shout out to the rest of the people on the list for making it. The notifications continue to pour in. Ah, the ephemeral joy of social notifications. I was a complete outsider to this community just a few days ago and was able to penetrate it with one tweet. This is powerful stuff. By identifying an ideal audience that is highly interconnected and shares a high degree of interests, I was able to achieve virality (or at least a sense of it). 32 of the Top 100 accounts have engaged with my content. Earned media drove 1,394 page views to my article on the topic. 88 percent of page views are new traffic. Average time spent on page 3:49 (most of them read it!). Personally, I gained over 50 new followers and a few new friends (and booked calls with top thought leaders). Now that I have an “in” with this community, I can use the information gathered from the Affinio analysis to keep this community engaged. By learning more about what they are passionate about, their interests, the topics they discuss, and the content they share, I can gain a share of voice in this community and begin to build relationships that matter. This is the kind of stuff that makes me geek out. If this also turns your crank, I would love to hear your thoughts on perceived virality. Tweet me or shoot me an email at India (at) Affinio.com.